Premium-grade materials, advanced construction processes and multiple mounting and suspension options allow for a wide range of live and installed applications. On-board switches provide preset EQ settings. The HF setting (fullrange models) can be set to VOCAL BOOST for additional presence in the critical mid-frequency area or FLAT for accurate reproduction of the incoming signal. The LF switch can be set to NORM, DEEP™ for additional bass extension, or EXT SUB (fullrange models) for use with an external subwoofer. The rear panel LED switch can be set to POWER, illuminating the front-mounted LED when the unit is powered on, OFF for applications where it is not desirable to illuminate the front LED, or LIMIT which indicates to the system operator that the clip limiter circuit has been engaged during operation. Fullrange models are housed in rugged ABS enclosures with a professional appearance that is at home in any application. ABS is a far more robust material than conventional speaker plastics and offers an additional measure of sonic clarity due to its internal rigidity. Ergonomic aluminum handles and a highly protective steel grille complete the package for ease of transport and long term durability. The K Series fullrange models feature a unique Tilt-Direct™ pole cup mounting system. A simple turn of the dial engages a 7.5 degree downward tilt of the speaker allowing acoustic energy to be kept on the audience and off reflective surfaces for applications where maximum coverage from a high-positioned speaker is desired. Integrated M10 suspension points allow for suspended applications with a K SERIES M10 KIT (sold separately) or Yoke bracket (sold separately). The KSub is a dual-12" bandpass design, constructed of premium birch and includes high-quality, low-noise casters. The subwoofer features a threaded pole receptacle for a positive, wobble free connection to a threaded speaker pole (included). Remote gain control capability is offered via a potentiometer (not included) connected to the on-board Euroblock connector. 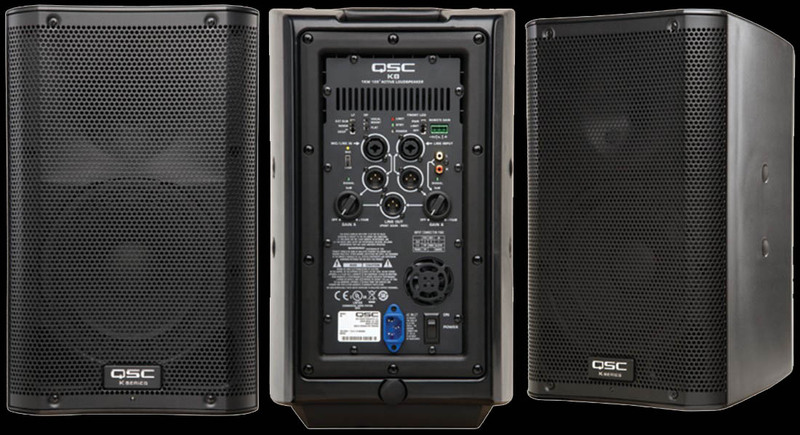 In an installed application, multiple K Series speakers can be "daisy-chained" for total gain control from a single remote pot. Auto-standby mode is engaged after 5 minutes of inactivity. - DMT™ (Directivity Matched Transition) provides for matched LF and HF coverage across the entire listening area, eliminating unnatural "dead" or "hot" frequency zones. - Intrinsic Correction™, first featured in our high-end line-array products maps 65-75 spacially-averaged measurements to IIR and FIR filters that actively adjust time, frequency and amplitude response to a maximally flat bandpass target. The result is a speaker that behaves equally well across the entire sound field. - DEEP™ and excursion limiting allow for extended low-frequency response by actively managing low-frequency transients without degradation of the underlying signal or adjacent frequencies. - GuardRail™ protection, first introduced on our GX Series amplifiers protects both the amplifier module and your performance from unnatural and destructive clipping.